The 2019 Farmer’s Market season begins May 4! I’ll be at the Southwest Plaza Farmer’s Market, most Saturdays from 8:00am to 2:00pm, located at 8501 W. Bowles Avenue and Wadsworth Blvd. Map here. EXCEPT FOR THESE DATES: I will NOT be at market on May 18, or June 8, 15, or 22. 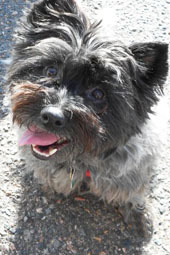 Please stop by to say hi, and to replenish your Furry Friend Biscuit supply! Comments Off on The 2019 Farmer’s Market season begins May 4! My homemade dog biscuits contain only the finest ingredients. Each biscuit is hand-cut and slowly baked to provide a great snack for your furry friend. I use local farm eggs, organic flours, organic herbs and spices, and many other natural and organic ingredients. I also buy raw honey from my Loveland veterinarian who has 14 hives in her backyard. I buy my high quality liverwurst (without chemical preservatives) straight from Continental Sausage in Denver. It’s good food. These biscuits are super tasty. They are loaded with flavorful ingredients like olive oil, organic peanut butter, Romano cheese, and free range ground chicken. Give your friends something that has taste and good smells! Why do you think they always beg at your kitchen table? 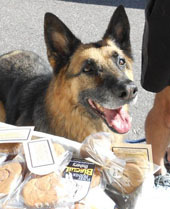 And if you or your dog are not completely satisfied with our biscuits, please return them for a full refund. We stand behind the quality of our dog biscuits 100%. 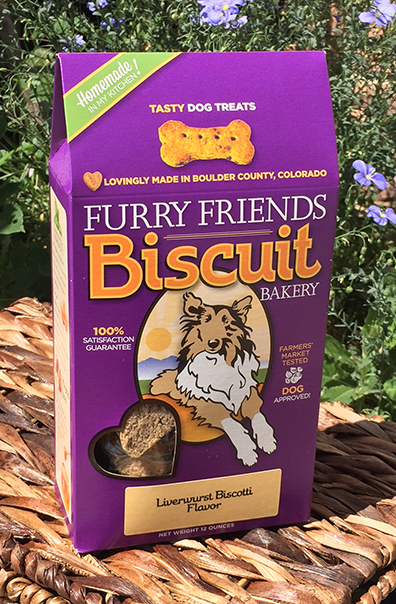 Our goal is to provide healthy, premium pet treats made with quality ingredients that will make our furry friends happy, while raising funds to keep our Colorado animal welfare organizations thriving so they will find homeless dogs and cats good homes. Recycled Paperboard: The wraparound package is made from recycled paper products. Please continue the recycling circle and recycle the package one more time. Humane Treatment/Free Range: It is important to treat the animals that provide us with food in a respectful manner. I use cage free eggs and ground chicken that grazed on natural grass and other good feeds. No microbial wash is used to preserve the meat. High Quality, Natural and Organic Ingredients: Where I can locate organic ingredients, I use them in my biscuits. Because this is a small company, the biscuits are not yet certified organic. Donate to Colorado Animals Shelters: While I recognize that the first year or so of my business will not realize a profit, my dream is to ultimately donate all of the net profits to Colorado humane societies and other animal welfare organizations that work so hard to find a forever home for our homeless animals. 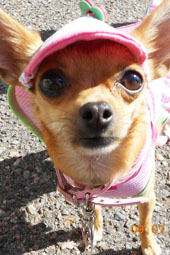 In the meantime, I donate regularly to Colorado animal shelters from the proceeds of the biscuit sales. Buy Local. Living in Boulder County, we are fortunate to be close to many small farmers. I purchase locally produced eggs, honey, meat, and veggies when available.